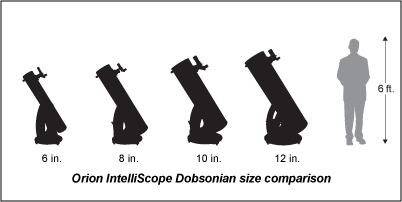 Our intelligent 8" Dobsonian reflector telescope has ample aperture and computerized smarts that make it an excellent instrument for any astronomy enthusiast. The Orion SkyQuest XT8i Computerized IntelliScope Dobsonian will give you speedy, push-button access to more than 14,000 fascinating celestial objects on the included IntelliScope Computerized Object Locator. Looking for the Whirlpool Galaxy? Press the button labeled "Messier" then select M51. Whoosh! Wow! In seconds, there it is in the telescope eyepiece, once you've pushed the telescope to the position indicated by the handheld Computerized Object Locator. Never been able to find that edge-on galaxy, NGC 891? Tap the "NGC" button, select 891 Whoosh! You're there. It's that easy to locate object after object, so many more in an evening than you could ever find before. Since the Orion IntelliScope Computerized Object Locator does not involve motors, you actively push the telescope following the directions displayed on the handheld IntelliScope controller until the object you've selected is centered. The XT8i IntelliScope will actually teach you about locations of objects in the night sky during use as you gently push the telescope from object to object. Instead of relying on power-draining GoTo system motors, the "push-to" IntelliScope XT8i saves energy and expense by running on a single 9-volt battery cell (included). The Orion SkyQuest XT8i IntelliScope Computerized Dobsonian Telescope is capable of providing you and your family with years of entertainment under the stars. Its 8" (203mm) aperture parabolic primary mirror serves up jaw-dropping images of the planets, cloudy nebulas, star clusters, and galaxies. Outfitted with great accessories, the XT8i IntelliScope Dobsonian includes two 1.25" telescope eyepieces, a removable eyepiece rack, base handle, collimation cap, and a finder scope. The 25mm and 10mm included Sirius Plossl eyepieces provide magnifications of 48x power and 120x power respectively for a variety of viewing options right out of the box. The included finder scope is our Orion 9x50 Right-Angle Correct-Image model which allows convenient and comfortable aiming and alignment of the telescope. The XT8i Dobsonian's precise Crayford focuser accepts 2" and 1.25" telescope eyepieces, and provides silky-smooth, backlash-free motion that eliminates image shift, making it easier to achieve the sharpest possible focus. The XT8i IntelliScope features an enameled steel reflector optical tube which boasts a handy "navigation knob" for easy slewing and repositioning of the telescope. The reflector tube rides on a streamlined, ultra-stable Dobsonian telescope base, which moves smoothly on non-stick PTFE and UHMW polyethylene bearing pads. The Orion CorrecTension system keeps the telescope tube perfectly balanced on the Dobsonian base for simple, effective point-and-view ease of use. Find out how much fun big-aperture stargazing can be with the "push-to" Orion SkyQuest XT8i Computerized IntelliScope Dobsonian. Select the object you wish to view from the IntelliScope database, then simply follow the directional arrows displayed on the hand controller by moving the telescope until the object is right in the eyepiece field of view - it's easy! A precise Crayford focuser allows use of larger format 2" telescope eyepieces - the bright, wide-field view of the Andromeda galaxy in a low power 2" eyepiece is jaw-dropping!